1st day: Departure from Quito aprox. at 08:00a.m. enjoying the beautiful landscapes of the Ecuadorian highlands trough the famous "Volcano Avenue". Ideal for photos. Visit to the Cotopaxi National Park Lunch included and departure to the city of Riobamba to spend the night in a typical hacienda f the region, Lodgement and Dinner included. 2nd day: Breakfast and departure by train aprox. 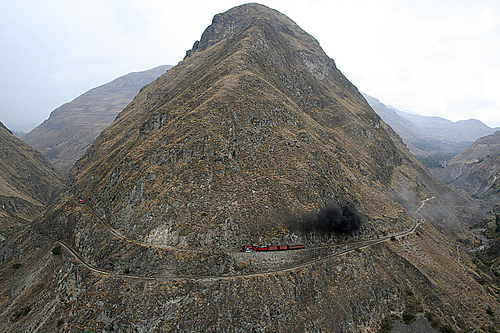 at 7:00 a.m. From Riobamba train station to the Devil Nose a unique piece of engineering in the middle of the Andes (ride of 7 hours aprox. Includes a Box Lunch). After the train ride visit to the Ingapirca Inca Ruins, the biggest Inca archaeological complex in Ecuador from the XV and XVI centuries, (ticket to the complex not included) trough the ride you will be to watch the weavers of the famous "Panama Huts" artisans tipycal from the area. Lunch Included. Arrive to the City of Cuenca to spend the night. Lodge included. 3rd day: Breakfast and city tour of the city of Cuenca visiting the Calderon Park, new and old Cathedral The park of the Flowers, the City Museum and modern art, the Cañari-Incas of all saints ruins, Canon of the Tomebamba and Turi River in the afternoon transfer to the airport to take the flight back to Quito (air ticket not included).